The Works by Women initiative celebrates the contributions that female architects and designers have made to New York's urban fabric. "From libraries and high-rise residential buildings to parks and public spaces, the nearly two-dozen projects featured in Works by Women help make visible the diversity in scale, type, and programme of the buildings and public spaces that women are designing throughout New York," said a statement from OHNY. In New York particularly, a variety of exhibitions featuring only female designers opened after president Donald Trump's inauguration, and architect Beverly Willis releases a film titled Unknown New York: The City that Women Built earlier this year. 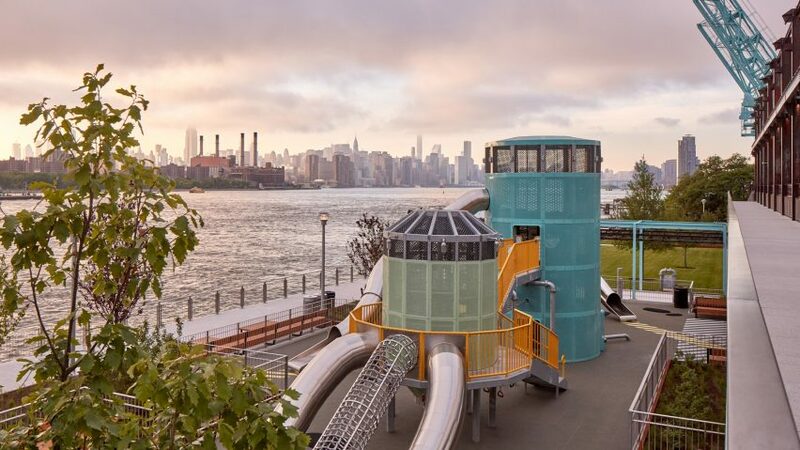 Sanjukta Sen, senior associate at Field Operations, will provide tours of the public park's activity spaces, reclaimed industrial elements and other amenities – all with panoramic views of the Manhattan skyline. Led by architect Deborah Berke, the transformation resulted in a contrast between the original masonry building and the light addition beside. Designer Yasemin Tarhan will give tours during OHNY. Situated between the pair of "dancing" towers completed by SHoP Architects beside the East River, this outdoor areas serves as both a civic space and a functional water filtration system. Public spaces across the Brooklyn Army Terminal complex received improvements from WXY, led by architect Claire Weisz, which included updated wayfinding for those traversing between the site's ferry landing, parking lots and building entrances. The second phase of the Hunter's Point South Waterfront landscape project, which completed in June 2018, rounds off the initial vision for 11 acres of continuous park space next to Long Island City. Designed as a "soft approach" to flood defences, the wetland landscaping includes a meandering causeway, grassy promontories, and a cantilevered viewpoint towards Manhattan. Marion Weiss of Weiss Manfredi will lead visitors around, along with partner Michael Manfredi, and Tom Balsley of SWA/Balsley. Another of Williamsburg's new public spaces, The Edge Park adds to the formerly industrial area's increased waterfront access.